Addiction treatment and behavioral health organizations have automation requirements needed by virtually no other specialty. 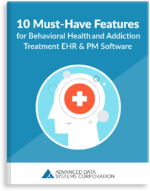 As a result, basic software cannot automate these facilities in the way they need; BH & addiction treatment software and its vendor should have certain “must have” capabilities and attributes. Our comprehensive guide includes ten “must haves” for addiction treatment facilities, centers, and networks to increase their levels of efficiency, revenue production, and system security. Fill out the form on this page to download your free copy instantly.